“Free tans!” said Chris Keet, upbeat after the success of this year’s Rincon Classic, talking about the sunny weekend. “Almost every wave was perfect,” said the Rincon Classic director, who got to compete in the Masters division when several entrants dropped out; the event had been stalled since January, waiting for the right swells to form. 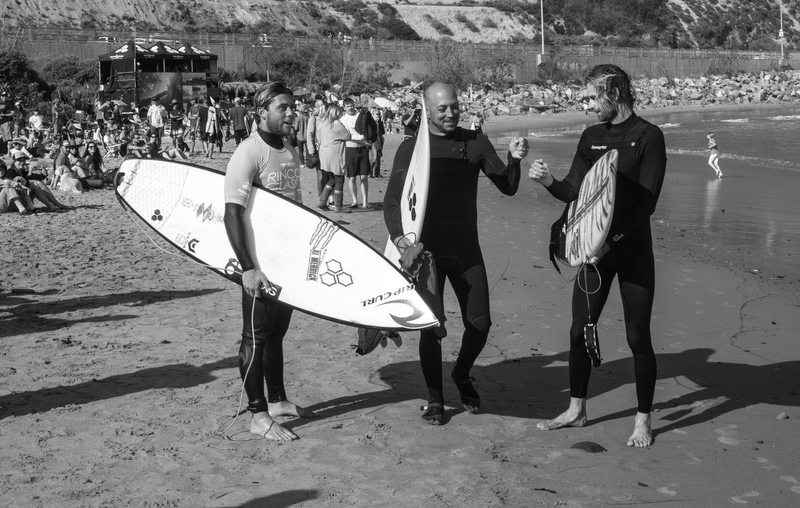 “People told me they got the best five waves of their lives,” Keet said of some Legends participants, many of whom grew up at Rincon. It’s where Conner Coffin got his start, Keet said, who won the pro division on Sunday, at the fabled right-hand point break. Coffin promptly gave his $1,200 winnings to Chloe Brown, the daughter of Chris Brown who had died in an accident in January. Makena Burke, a pro surfer from Ventura, dominated both women’s divisions. When asked how surfing is judged, Keet quoted the surf metric: Speed, power, and flow, or, “the surfer who executes the most radical controlled maneuvers on the biggest and/or best wave in the most critical section for longest functional distance.” A head judge and several world-tour judges ranked the levels of difficulty. Awards included wood surfboard trophies, some cash for the pros, gifts, and a friendly day at the Queen. About 20 women and girls competed in two divisions, and about 140 men competed in various age groups. Cole Robbins won the longboard division, Jackson Meskis the boys under-12, Hamilton Jacobs boys 12-14, Jabe Swierkoski boys under 17, Frank Curren men’s, Javi Moreno men over 35, Bromi Krock men over 55, and Tony De Groot the Legends division.